I started this site so I could share what I’ve learned about art with others. Writing about art also helps me to distill my thoughts about my process and about the techniques that I use. This site is fairly new but I will be adding more articles about a variety of topics and mediums. 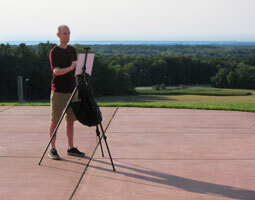 There are articles for beginners and advanced artists. 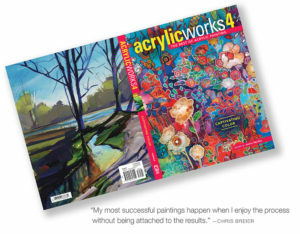 My Painting “Early Spring” is on the back cover of Acrylicworks 4, published by North Light books. Click to enlarge. I named it drawing and painting for fun because that’s why I got involved in art as a kid–for the fun of it! Selling my art or having exhibits wasn’t a concern. I enjoyed making drawings and working with color. It’s exciting to see a bunch of lines and shading gradually form into an illusion of reality. Wherever you are in your art career, I would like to encourage you to continue on with making art. Ignore the critics and the naysayers! The art world can take itself a little too seriously at times. This is unfortunate because I think it intimidates people from taking it up as a hobby. Making art is a form of play and I don’t see why you shouldn’t continue to play as an adult. Learning how to draw can improve your eye-hand coordination and help you to become more creative. It can also increase your confidence and frustration tolerance. These improvements should also benefit the other areas of your life. Two of my drawings were published in Strokes of Genius 8, published by North Light Books. Click to enlarge. Creating art is much more productive than sitting in front of TV. Art can be a hobby or a full time career. You have no idea where it may lead. I hope this site helps you progress!